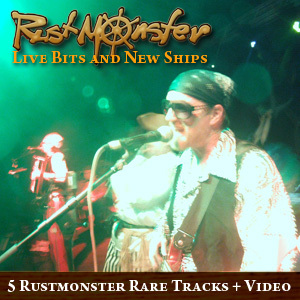 We know it has been a long time since you have heard any new pirate music from Rustmonster. We apologize. The band has been busy pursuing other adventures. We promise to get back to our third pirate themed album soon. In the meantime, we present 5 new tracks and an original Rustmonster rock video to scratch the itch. This EP contains 2 original songs by Rustmonster, Overature and Guns Bacon and Rum (a song written about the intrepid Captain Bilgemunky and his unconquerable podcast). We have also included 3 live tracks, digitally mastered, from our Pirates vs. Bigfoots show, held in October of 2011. These three tracks also feature Bilgemunky as a guest performer. Lastly, we have included a hi-res copy of Rustmonster’s rock video, Devil’s Children. Although you can download this EP for free, we encourage you to support the band by leaving us a small donation. We’ll leave the amount up to the dictates of your own conscience. Good listening and we’ll see you soon.